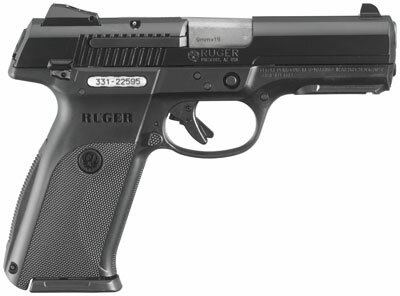 The Ruger SR9 is sized to be comfortable and controllable with a slim, ergonomic grip and a narrow slide. The structurally rigid, recoil-reducing, glass-filled nylon frame and alloy or stainless steel slide combine to create a low-maintenance, rugged, and reliable handgun. The SR9 features a modern blocker, trigger safety, magazine disconnect, and a visual and tactile loaded chamber indicator. In addition, the SR9 has a unique reversible backstrap (flat or arched), an adjustable 3-dot sight system, an ambidextrous 1911-style manual safety and magazine release, and a built-in Picatinny rail.